White EPDM combines the high-performance standards of traditional EPDM with a highly reflective, environmentally friendly surface designed to cut energy costs. In addition to the oils and the polymers used to make an EPDM membrane, another ingredient is added to the mix to enhance UV resistance. In the case of a black membrane, carbon black is added, which converts UV rays into heat. With white membrane, in lieu of carbon black, titanium dioxide is typically used to reflect UV rays and prevent it from attacking the polymer. When used appropriately, usually in warm climates, white EPDM can reduce air-conditioning costs without sacrificing durability of the roofing system. Because of its reflectivity, white EPDM is installed using mechanically attached or fully adhered systems. 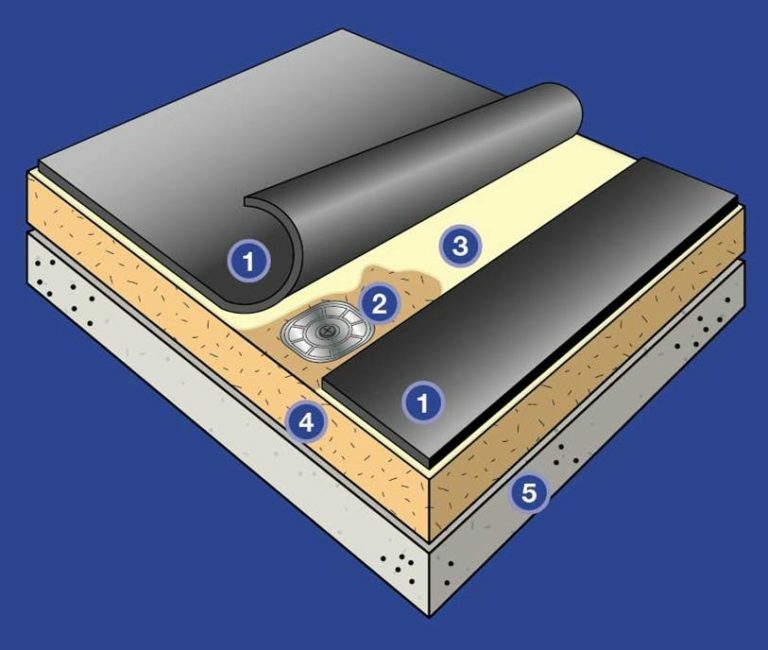 Ballasted systems, the workhorse of the three EPDM roofing systems, account for approximately 35 percent of EPDM installations today. Using large panels measuring up to 50 feet by 200 feet, the ballasted system provides fast coverage at a relatively low cost. 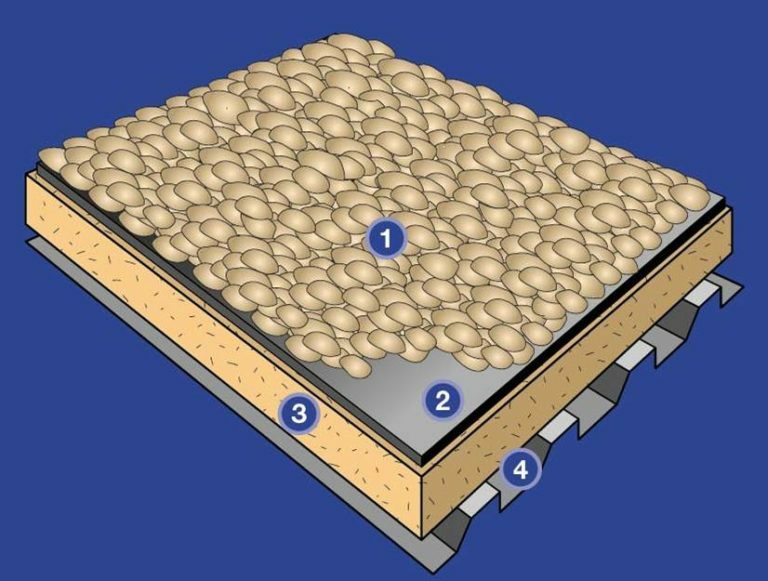 The EPDM panels are loose-laid over the insulation and held in place by smooth, river-washed stoned or concrete pavers. Ballasted systems are primarily used for large new construction projects, but can also be used on roof replacement or recovery projects where the existing structure can support the additional weight. Ballasted systems are traditionally the easiest of all systems to install and have earned the Underwriters Laboratories Class A rating. Mechanically attached systems can be installed using large panels and attached through the membrane, or using narrow panels attached in the side laps. Non-reinforced or scrim reinforced membranes can be used, depending on the needs of the building owner. The membrane is then attached using either round plates of batten strips to the underlying deck. Mechanically attached systems are lightweight and are ideal for all building sizes and configurations. Fully adhered systems using panels measuring up to 30 feet by 100 feet. 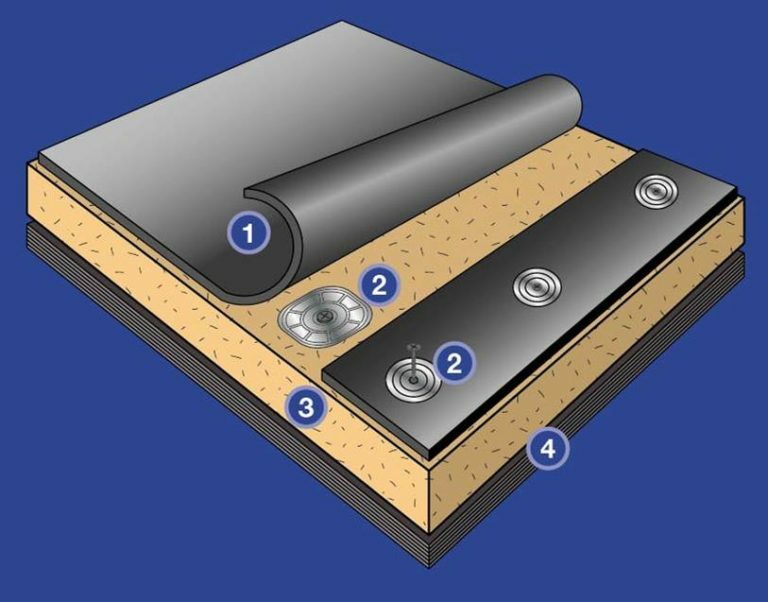 The membrane is bonded to the insulation, which has been physically attached, utilizing mechanical fasteners, stress plates and/or adhesives. Either non-reinforced or scrim reinforced membrane can be used, with the non-reinforced membrane making up most adhered installations. Fully adhered systems are lightweight and ideal for a wide range of building sizes and geometric configurations, including high-slope applications. Because of recent technological advances in application, the fully adhered system is becoming the system of choice for roof replacement applications in many areas of the country.